You found the perfect home with people who love you. So smart that you know so many tricks. People, and your "husband" love you. Hi Cassie! Happy Dog of the Day! So, let's review! You're gorgeous, athletic, intelligent and talented; joyful, bursting with personality with a heart of gold! Who could ask for more in a furkid! But wait! I forget to add what makes you so EXTRA special! You're a rescue!!! Endless thanks to your mom for choosing adoption, opening up her home and heart to one amazing, beautiful, most deserving girl! If anyone should ever doubt the priceless rewards of rescue they need only read your backstory, your proud mom's glowing, love filled tribute, pore over your heart-melting photos! How blessed she is, having a furkid, a best friend, a furry soulmate in you, Cassie! You truly are the love of her life, and understandably so! You're just as special as they come, a treasure, simply the best! No doubt about it! You and your mom were destined to be as one, together forever! Thanks for the BIG smiles, sweetheart! Reading heartwarming rags to riches stories such as yours is what makes Dog of the Day so special! I hope you're enjoying a fun filled, action packed day of celebration, sweetheart...spending special time with your beloved Aussie doggie mate; playing ball and chasing critters; chowing down on chicken and steak, hehe; cuddling with your mom; being loved and pampered to pieces! Lots of love, hugs and kisses to you, beautiful Cassie, our very special and most deserving Dog of the Day, EVERY day! Love to your hubbie, too! 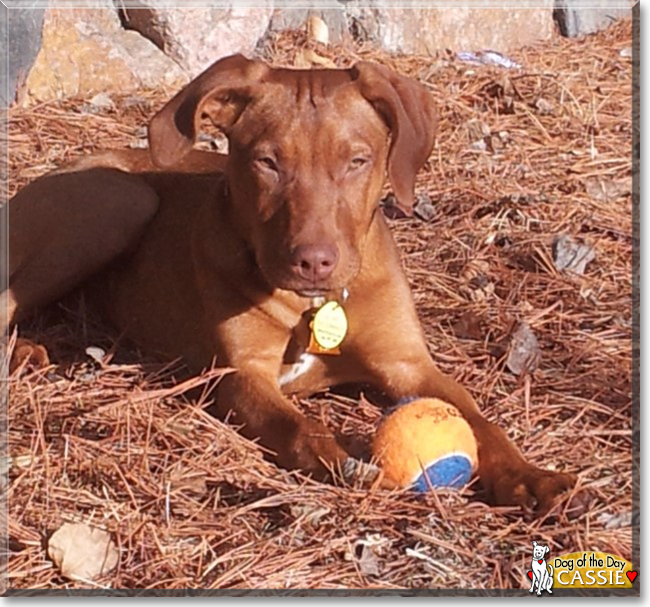 Dearest Cassie, what a beautiful Hungarian Vizsla you are! You are absolutely gorgeous in those great photos, with your lovely brown fur and brown eyes and big pink tongue. And how sweet, you and your dear person smooching! We are so glad you were rescued and came to the shelter, where you and your dear Furrrever family met and adopted each other! You are very smart and full of energy, and you make your dear people smile with your antics and tricks. And how nice to learn of your Australian Shepherd husband! You and he and your dear special friend all love each other very much, don't you. What a wonderful love-filled home you share! 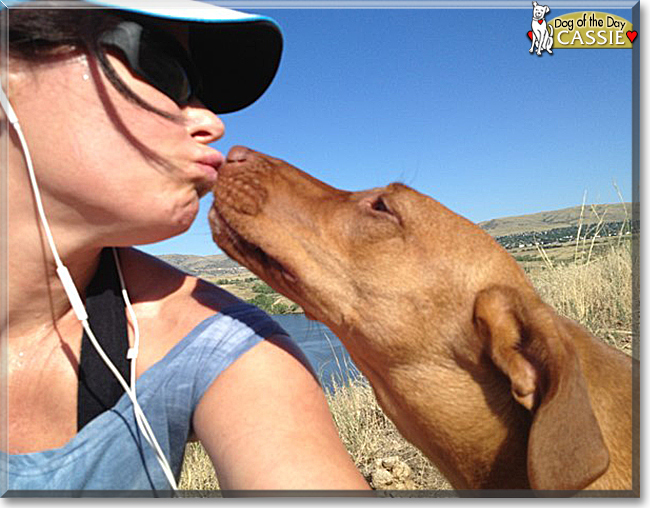 Congratulations, darling Cassie, on being chosen today's Dog of the Day! We hope you and your dear husband and special friend and barn cats and all your family and friends are enjoying a fine celebration, full of fun and lovies and all your favorite games and treats. Congratulations on being today's Dog of the Day, beautiful Cassie!